When will enough be enough for BrightSource? Google today said it would invest $168 million into the Ivanpah solar thermal power plant being erected by BrightSource Energy, as the melodrama of solar thermal approaches its boiling climax. 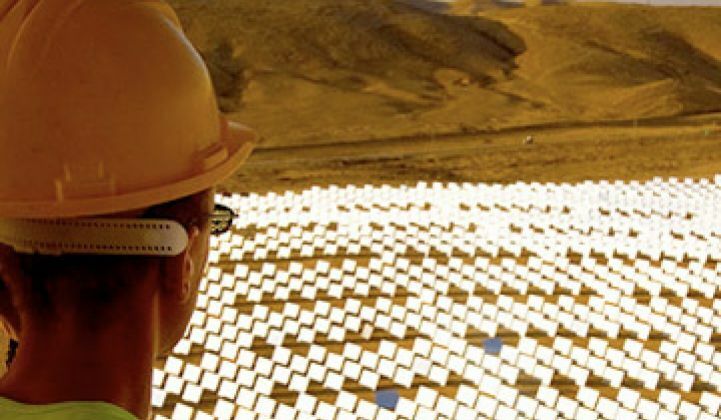 The Ivanpah plant, rated at 392 megawatts, is slated to be the first in a series of large solar thermal plants from BrightSource. The company has additional power contracts for 1,300 megawatts with Southern California Edison and 1,310 megawatts with Pacific Gas & Electric. Other developers/technology providers like Solar Reserve, Areva Solar and Solar Millennium have similar plans. Areva is slated to make announcements about large power plant projects soon. The technology underlying Ivanpah and many of the other new projects differs from conventional solar thermal power plants. At Ivanpah, fields of relatively flat, computer-controlled mirrors will focus the heat of the sun onto a water tank to create steam. The steam ultimately powers a turbine. The architecture, says BrightSource, can more economically and efficiently capture and transfer energy than the traditional systems that use parabolic mirrors to heat oil in tubes. BrightSource should know: It grew out of a parabolic company called Luz that built some of the most successful parabolic fields ever erected. Solar thermal plants, however, aren't cheap, and they can require years to complete. What happens at Ivanpah could set the tone for the industry. NRG Solar said last year that it would invest $300 million in the plant and participate in construction. Bechtel has also invested in Ivanpah, and the whole thing is backed by $1.3 billion in DOE loan guarantees. In all, the plant will cost more than $2.1 billion. The Ivanpah plant, due to be completed in late 2012 or 2013, has also been the subject of lawsuits by environmental groups despite approval of the project by both the Department of the Interior and the state of California. To mollify some objections, BrightSource has already scaled down the size of the project. Solar thermal plants also have to contend with another factor: the declining cost of solar power plants built around photovoltaic panels. Google's investment will no doubt help BrightSource achieve its objectives. Nonetheless, it also raises the stakes, so if delays or problems arise, it may give investors in other projects pause. BrightSource proper has raised over $530 million from investors such as VantagePoint Venture Partners, BP Technology Ventures, Chevron Technology Ventures and Google Ventures. Like First Solar and SunPower, BrightSource's core business is in developing technology, but it also participates in developing power plants based on its products. Google has invested $250 million in alternative power projects, including wind and solar farms.